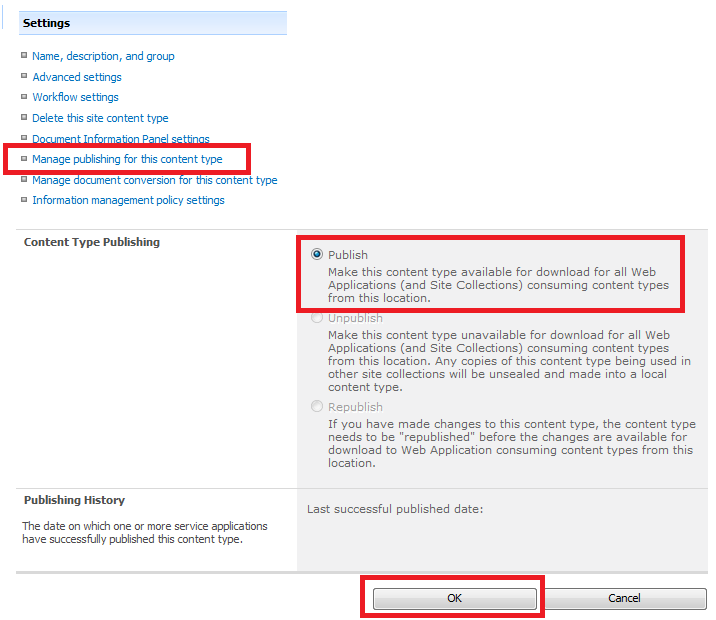 In a SharePoint Server 2010 environment, custom content types have been created on a Content Type Syndication Hub site collection (Content Type Publisher). However, the Content Type Subscriber site collection does not contain published content types in its Site Content Types Gallery. 3) The Managed Metadata Service Connection is configured properly and the setting for "This service application is the default storage location for Keywords" is checked off. The following steps may be required to synchronize the content types between the publisher and the subscriber. Click on "Manage publishing for this content type"
Set the View to "All"
Set the View to "Web Application"
Click on the Timer Job, "Content Type Subscriber"
Microsoft TechNet (May, 2010). Content type and workflow planning (SharePoint Server 2010). Retrieved May 26, 2011 from http://technet.microsoft.com/en-us/library/cc262735.aspx. Hi Nicholas. Why do you have to activate the "Content Type Syndication Hub" feature on both the Publisher and Subscriber site collection? I've only got the feature enabled on my Publisher Site Collection (the hub), and not on my Subscriber Site Collection, and the Publishing and Subscribing mechanism of Content Types works fine. The description of this feature is: "Provisions the site to be metadata hub site", which indicates that it's only necessary to activate this feature for the actual hub portals, and not the subscribing portals. Is there a specific reason for you to activate this feature on both portals? Bastiaan, thank you for responding. I originally had the Syndication Hub feature running on both sides (Publisher, Subscriber) in my development environment when I wrote the post so I listed it as an assumption to accurately describe the configuration that I actually tested. However, I understand and agree with your point! I modified the post to say that the syndication hub is only running on the Publisher. Thanks!